Every mother-to-be is familiar with predictions about the gender of her unborn child. “You’re carrying low—must be a boy!” “You’re eating lots of sweets—that means you’re having a girl!” Everyone loves to weigh in on this particular topic of conversation. From friends and family to strangers in the supermarket, people are always interested in new life and predicting which direction it will go. 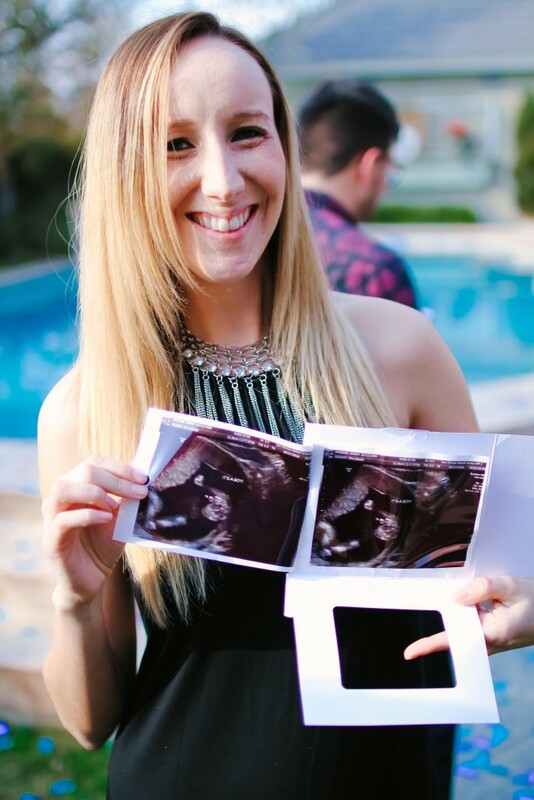 Finding out the gender of their unborn child is incredibly exciting to expectant couples. Today, many parents-to-be invite friends and family to participate in the fun of finding out. Gender reveal parties are almost as popular as baby showers these days. In case you live under a rock, a “Gender Reveal” party is where the couple forgoes finding out the gender during the ultrasound and instead has the technician place a card indicating the gender in a sealed envelope. 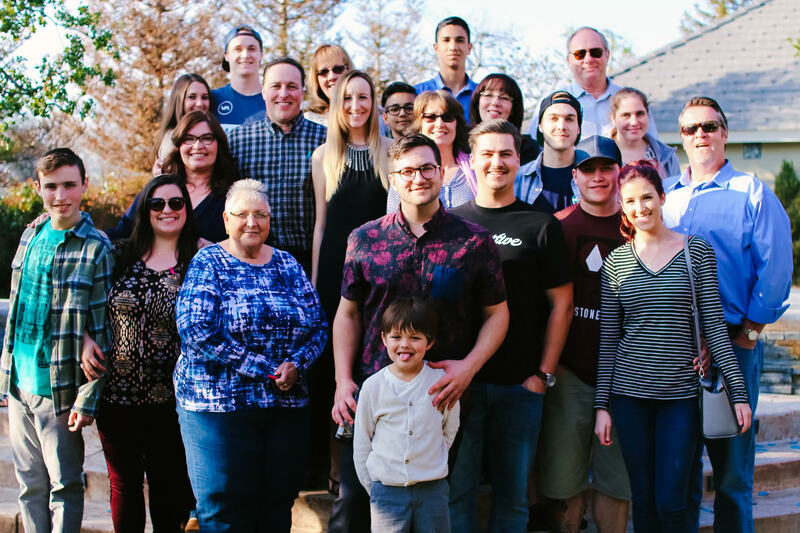 The “reveal” takes place in the presence of friends and family. Guests “weigh in” with their predictions by wearing pink or blue, and no matter which “team” wins it’s always great fun all around. There are a number of ways to announce the news at gender reveal parties. One the most popular ways is to have a bakery fill a cake with either pink or blue filling. Another trend is to have the couple blow into a pink and blue balloon, the actual gender being the one that inflates while the other balloon is popped beforehand. 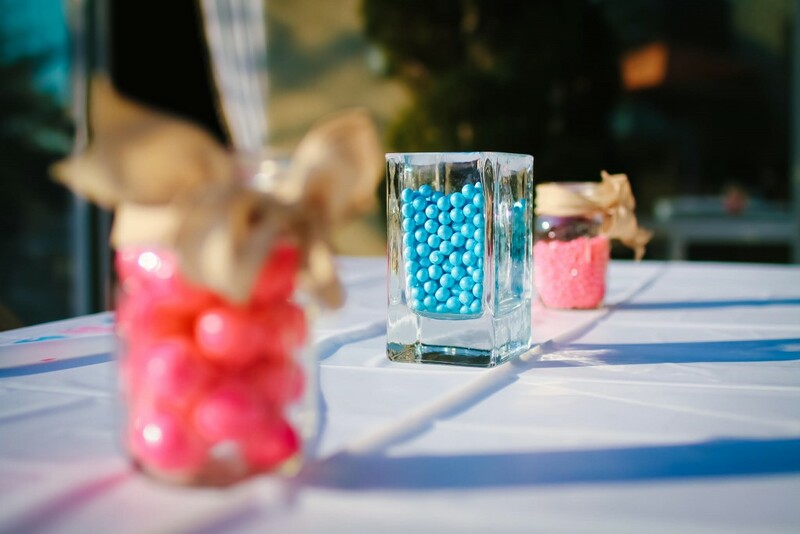 Other gender reveal methods include silly string, pinatas, boxes full of balloons, and even color powder. 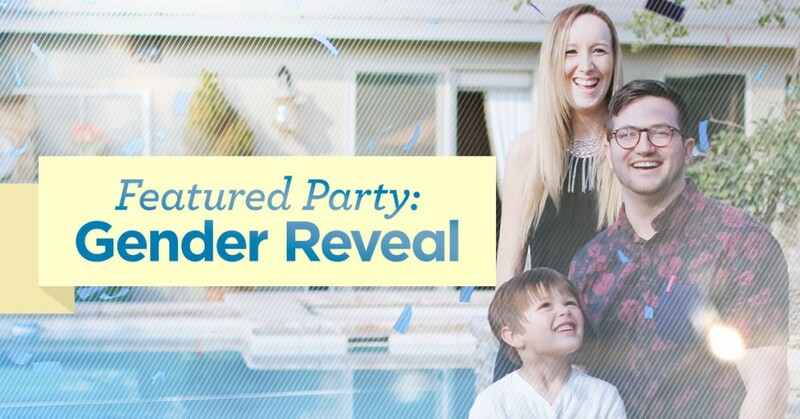 When it comes to gender reveal parties, the sky really is the limit! 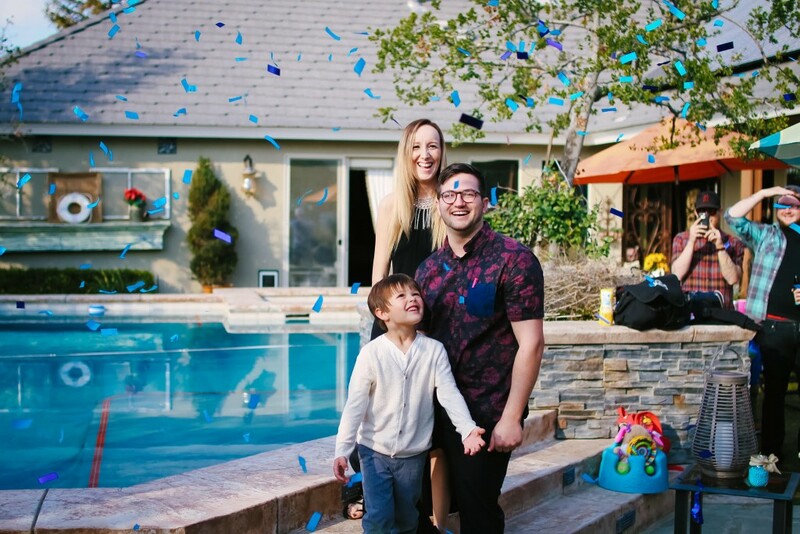 One of our personal favorite ways to reveal the gender is by using our Gender Reveal Confetti Kit! 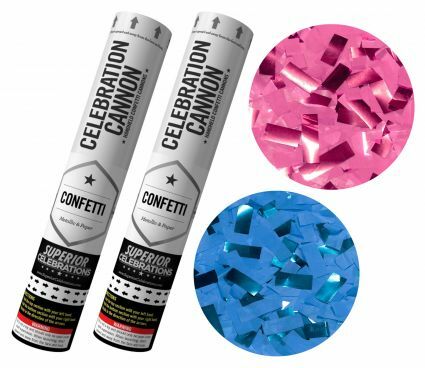 This kit includes two of our 12-inch confetti cannons, one with blue confetti, and one with pink confetti. Containing a mixture of metallic mylar and paper confetti, our cannons launch about 10 feet into the air. 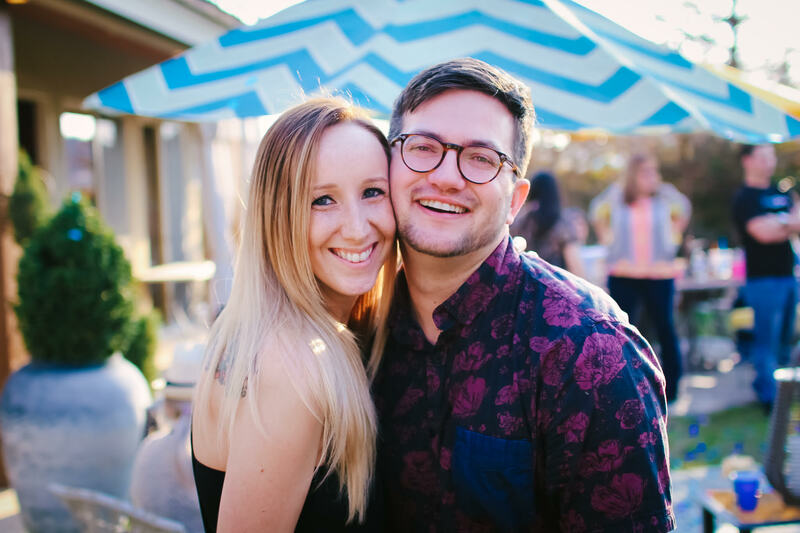 Expecting parents, Bryant and Sarah chose to use our confetti cannons at their gender reveal party and we just love the fun and casual vibes that radiate from their party. 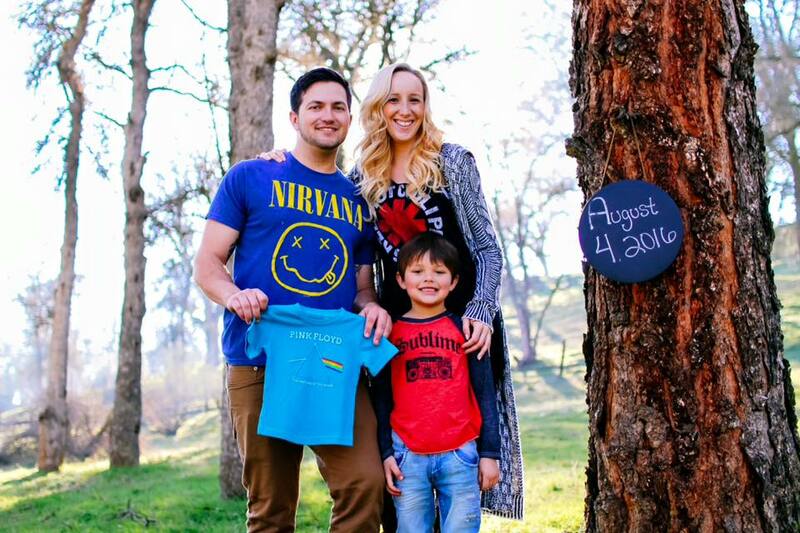 What more could you expect from a couple who announces their pregnancy with legendary band teeshirts? Friends and family gathered at Bryant’s family’s home for a BBQ. The “teams” were divided pretty equally and Bryant said that the main objective was just to hang out and celebrate the new baby. 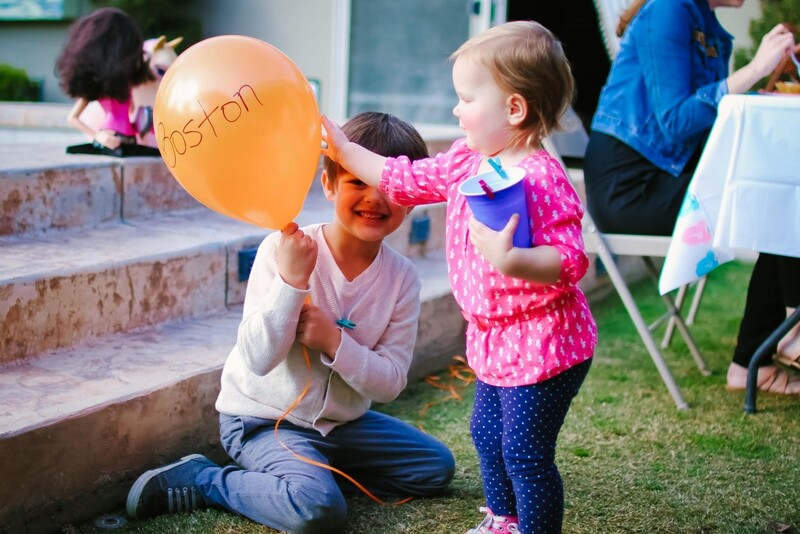 With all the pink and blue going on around them, Bryant had to placate big brother Boston with his own orange balloon. It’s important to recognize the status of older siblings at these shindigs. After lunch was served and votes were cast, the whole crowd was ready to witness the momentous gender reveal! 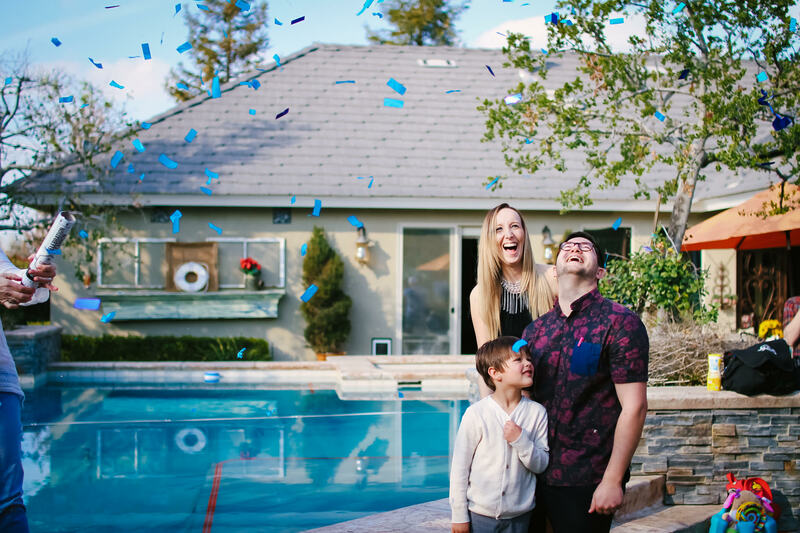 Our gender reveal confetti cannons come in a pack of two and arrive with top-secret instruction to insure nothing gets leaked! Bryant had his aunt launch the confetti cannon so that he, Sarah, and Boston could enjoy watching the confetti pop. It’s a boy!! The magic of these confetti cannons are not lost on Boston. Look at his sweet face absorbing the big news! Congratulations, Bryant, Sarah, and Boston! Thank you for letting Superior Celebrations be a part of your big day! If you or someone you know is looking for a fun and creative way to have a gender reveal party, we encourage you to use our Gender Reveal Confetti Kit. From the first POP to the final falling piece of confetti, our cannons are a magical way to announce your little boy or girl to the world! If I were to order blue and pink in advance of our party and then wanted to return the color we did not use would that be an option? Unfortunately, we cannot accept returns on confetti cannons. Depending on where you live, though, we may be able to ship to you within a couple of days. That might allow you to learn which color you need before the party and just order that. Most couples end up buying both colors, then save the unused color for another occasion like a birthday or New Year’s. As long as you use them within the next few months, they’ll still work just fine. I hope this helps! Are there two shades of blue or pink in the cannons? Yes, these confetti cannons actually contain two different materials — tissue paper and mylar. The mylar tends to appear a little darker, but it’s reflective so it shimmers beautifully when it flutters back down. The combination of the two materials provides a really nice effect!